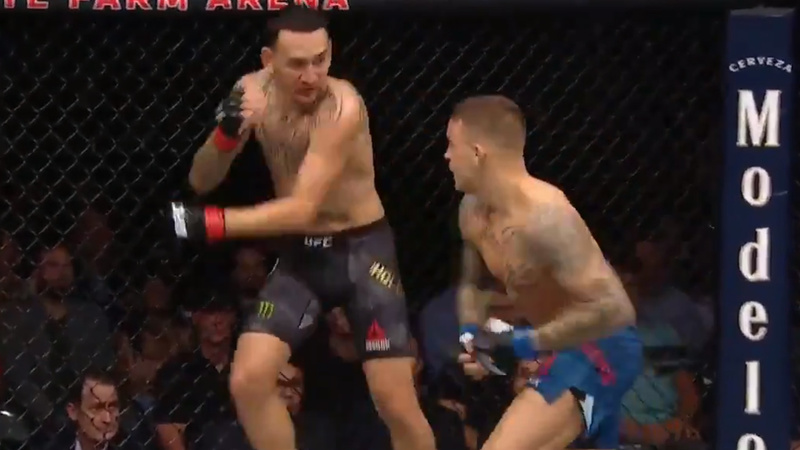 Dustin Poirier Outboxes Max Holloway In A Wonderful Fight! UFC 236 PPV (pay-per-view) event, which is happening live from inside State Farm Arena in Atlanta, Georgia tonight (Saturday, April 13, 2019), is headlined by an intriguing Interim Lightweight title match between the current UFC Featherweight champion Max “Blessed” Holloway and BJJ black belt Dustin “The Diamond” Poirier. The two already met at UFC 143 on February 4, 2012, where Dustin Poirier forced Max Holloway to surrender after mounted triangle armbar in the first round. The third man inside the Octagon is Blake Grice. The match is underway! Here is an interesting fact – Dustin Poirier has a reach advantage! Fighters don’t touch gloves. Poirier is a southpaw. Dustin goes for a front kick but misses. Wow, great combo by Poirier left overhand followed by a low kick. 1-2 Max. Left front kick Poirier, followed by a right low kick. Holloway keeps landing 1-2. Low kick Poirier. Body shot Holloway. Poirier misses with a high kick but lands a low kick. Wow, big left hand by Dustin Poirier, but Poirier eats a big shot and goes down. Poirier is on the cage but survives. What a great start of the fight. Holloway lands a big left, but eats a big right hand!!! Poirier keeps going forward and attacks Max, this is a wild brawl, it was more than 20 shots!!!! Wow, what an overhand right. Holloway is rocked, good clinch knee by Dustin Poirier, Poirier landed more than 10 clean shots. Holloway survives, big left hand Dustin. Is Max Holloway bleeding? Yes, he does!!! What a right hand by Holloway!!! Left cross Poirier. Wow man right hand followed by a left straight, a good takedown by Poirier, Holloway gets up!!! Good left hand Max. Right uppercut Poirier missed by a hair. It seems Poirier is tired. Max Holloway looks rocked again but continues going forward. Poirier runs forward but eats a big right hand. What a great high kick by Holloway, one of the best rounds I’ve ever seen, I think 10-9 Poirier. Holloway is advised to slow the pace down. Fighters circling around, body shot Holloway. Wow, this was BIG LEFT HOOK HOLLOWAY!!! Poirier survives. Poirier escapes and ducks under again. Body shot Holloway, Dustin misses by a hair with a big right hand. Great right hand Dustin. Body shot Holloway, and now he lands a wonderful combo. Poirier is tired?! Right cross Poirier, followed by a left hand. Max Holloway challenges his rival to go forward, good body shot. Holloway intentionally provokes Poirier to go forward. What a left hand by Poirier!!! 1-2 combo Holloway, good body shot. Front kick Poirier, Holloway attempts a high kick but ends up in the opponent’s guard. Takedown attempt, Max defends well, the brawl continues. Left cross Holloway. Superb middle kick Holloway, followed by a punch combo, it was 3 or 4 hooks, Holloway looks better in this round. Body shot Holloway, followed by a right middle kick. Big left hook Poirier, and again!!! Holloway is rocked strong punches by Poirier!!! Again superb right hand by Poirier, it seems Holloway is rocked, luckily, Poirier missed with a right uppercut. Left hook just missed. Wow, how many strikes! Holloway challenges Poirier to punch him to the face. I just love this one!! The end of the round, 10-9 Poirier. Dustin Poirier is ordered to go forward and to stay away from Holloway’s long range punches. 1-2 Holloway, excellent low kick Holloway. Great punches on both sides, Poirier counters with a big right hand. Kick to the body Poirier. Holloway goes again for 1-2, ends the combo with a right punch to the body. Left uppercut to the body Poirier. Amazing 3 punches landed by Holloway, left-hand counter Poirier. Awesome exchange on both sides. Superb left hand Poirier, but Max is an alien! Poirier misses again, Holloway slips, and now delivers three punches to the head. The Hawaiian controls this round well, his slips are just stunning. Wow, superb left uppercut to the head by Poirier. Poirier misses and eats a counter. Holloway lands a big right hand. Jab Poirier, Holloway’s nose is in big trouble. Again jab Poirier. Left hand to the face Poirier. Left uppercut, right-hook Holloway, Poirier counters well. Superb-right hand Holloway, Poirier misses over and over. Holloway lands 5 or 6 clean strikes, amazing flying knee to the body Holloway, Poirier does a reversal and pushes Max against the cage. Poirier goes for a takedown, Max defends with a guillotine choke, and now these short elbows to the head. The referee warns Holloway for illegal blows, Poirier continues clinching up, he isn’t letting his opponent go. I think 10-9 Holloway. Holloway’s corner gives him the recommendation to use his left hand a bit more to create an opening. Poirier changes the pace, goes for a takedown and succeeds. Max Holloway is against the cage, he sits on the fence. It is hard to keep Max Holloway on the ground. Max gets up and goes for a guillotine choke attempt. The fighters separate, Holloway lands a big flying knee to the head. So many strikes on both sides, it turns into a wild brawl again! Big right hand, followed by so many wonderful hooks Holloway. Poirier is on the fence, he covers up. Amazing left hand Holloway. Poirier is in the problem again, he misses with a right uppercut. Brutal right hand by Max Holloway. Poirier is on the fence, his opponent lands a combo to the body. Holloway looks better in this round, great body shot. Superb left hand to the face, Dustin. And again a punch to the nose, Holloway missed with a right hand to the chin. Great right hook Poirier followed by a knee. Holloway is cut open!!! Poirier misses again but lands a few big strikes. Holloway is bleeding heavily, the referee could stop this fight! Poirier goes for a takedown, but his rival defends with a guillotine choke. Dustin Poirier is keeping Holloway on the fence. Max bleeds heavily, few short punches. Poirier goes for a takedown, but the two ended up in a north-south position. D’Arce choke attempt, round ends, 10-9 Holloway. Holloway’s cut is nasty! Max wants to continue. The match won’t be stopped. Big left hand to the face Holloway. Left hook middle kick Holloway. Max moves forward, left hand by Poirier. Holloway delivers a big combo to the face. Superb counter Poirier. An outstanding punch to the head Holloway. Right uppercut just missed. Holloway is bleeding heavily. Right hand to the face Poirier, Holloway ducks under. It seems this right hand was great. Poirier collects another point. Left cross Dustin. Body shot Holloway. Awesome punch. Poirier misses again, eats a high kick. Awesome combo Holloway, three strikes to the body. Poirier misses with a right hand. Five excellent strikes to the face by Max Holloway. Dustin shoots in, Holloway is on the cage. The Hawaiian defends well, he gets up, and now Dustin presses him against the fence. Dustin goes for a single leg, but Holloway bends his knees and defends. Dustin Poirier controls the position, he tries to maintain Holloway on the fence. But Holloway slips away, makes a reversal, now Dustin is on the cage. The fighters separate, few more hooks. The match is over. I am unsure about this round. Let’s see the judges’ scorecards. Max Holloway drops to 20-4 MMA, 16-4 UFC, Dustin Poirier improves the result to 25-5, 1 NC MMA, 17-4, 1 NC UFC. Amazing opening round for Dustin. But max isn’t done! Great round of action!